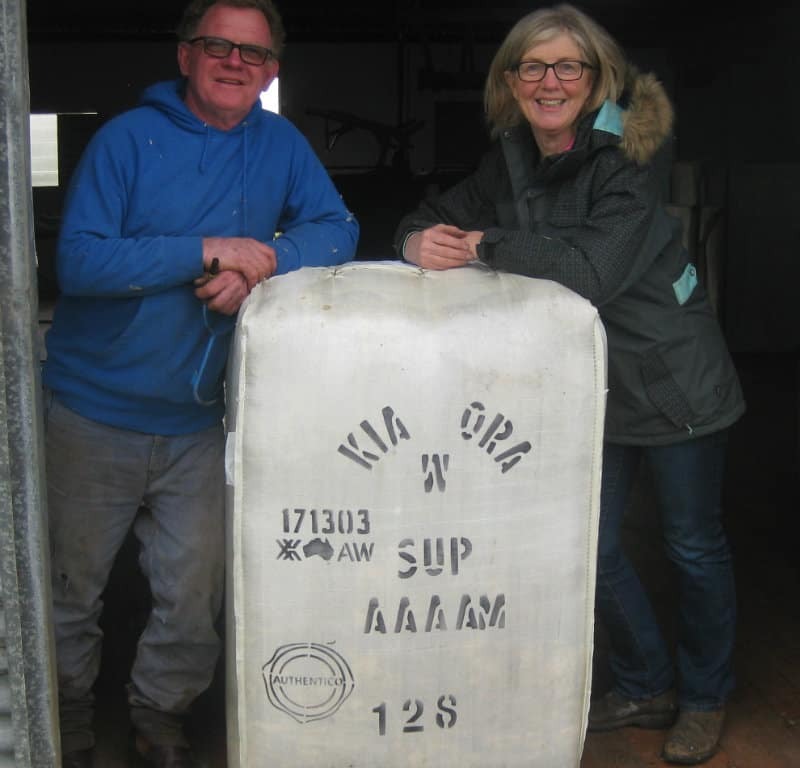 One of the first Wool Growers to register with Authentico: Brendan and Susan Finnigan of Kia Ora Merino, Victoria. Authentico is a new integrity code established by The Schneider Group. Authentico ensures a transparent supply chain from the farm gate of Authentico certified wool growers to the delivery of wool tops to customers of The Schneider Group. Authentico makes use of existing standards, best practices and legislation already honoured by Australian wool growers. In Australia, wool growers already comply with a large number of requirements in the domain of animal welfare, quality assurance and environmental care. For example, the integrity scheme asks for the completion of the National Wool Declaration, use of pre-operative anaesthetic, ceased mulesing or non-mulesing. The market already has a number of integrity schemes which focus especially on animal welfare on farm. However, tracing the values down the supply chain often remains a challenge. As a large wool buyer, exporter and topmaker The Schneider Group believes to have a unique role in offering a transparent supply chain. Through its buying operation in Australia, Schneider can easily connect with licensed wool growers. Once the Authentico wool has been bought at auction, the wool stays within the Schneider supply chain during transport as well as the scouring and combing process. The Group’s network and infrastructure ensures full traceability from farm to wool tops. Customers of the spinning, weaving and garment manufacturing industry can then track Authentico wool products up to the retail floor. Wool growers who wish to be part of the Authentico scheme can register online by filling in a short and easy registration form. Authentico licensed wool clips will be listed in the catalogue and are available for sale at auction. The Schneider Group will purchase Authentico licensed wool that is suitable for its wide range of types, privately or at auction, to build commercial quantities for export to its own specialised combing mills in Italy, Egypt and China. The wool will be scoured and combed into wool tops for sale to spinners, weavers and retailers. During this entire process, the wool is fully traceable back to its origin. In addition to on-farm best practice, The Schneider Group also aims to minimise its own environmental impact of transportation and processing within its own supply chain. The Schneider Group will provide details on CO2 emissions, chemical usage and water consumption for each Authentico lot. The integrity code will be rolled out in Australia for the first time during the 2018/2019 season. In the long term, the scheme will be extended to other countries incorporating other natural fibres as well. Before launching Authentico publicly, a small number of wool growers were invited to test the scheme. Hamish McLaren of family-owned Nerstane stud in NSW said signing off on animal welfare and other on-farm practices was valuable in being able to show those along the wool chain like topmakers, spinners and retailers they were doing everything to run their sheep and their enterprise in the best possible manner.